Citation Information: J Clin Invest. 2006;116(5):1443-1456. https://doi.org/10.1172/JCI27804. Why some virus-specific CD8 TCR repertoires are diverse and others restricted or “oligoclonal” has been unknown. We show here that oligoclonality and extreme clonal dominance can be a consequence of T cell cross-reactivity. Lymphocytic choriomeningitis virus (LCMV) and Pichinde virus (PV) encode NP205–212 epitopes that induce different but highly cross-reactive diverse TCR repertoires. Homologous viral challenge of immune mice only slightly skewed the repertoire and enriched for predictable TCR motifs. However, heterologous viral challenge resulted in a narrow oligoclonal repertoire with dominant clones with unpredictable TCR sequences. This shift in clonal dominance varied with the private, i.e., unique, specificity of the host’s TCR repertoire and was simulated using affinity-based computer models. The skewing differences in TCR repertoire following homologous versus heterologous challenge were observed within the same private immune system in mice adoptively reconstituted with memory CD8 T cell pools from the same donor. Conditions driving oligoclonality resulted in an LCMV epitope escape variant in vivo resembling the natural Lassa virus sequence. Thus, T cell oligoclonality, including extremes in clonal dominance, may be a consequence of heterologous immunity and lead to viral escape. This has implications for the design of peptide-based vaccines, which might unintentionally prime for skewed TCR responses to cross-reactive epitopes. 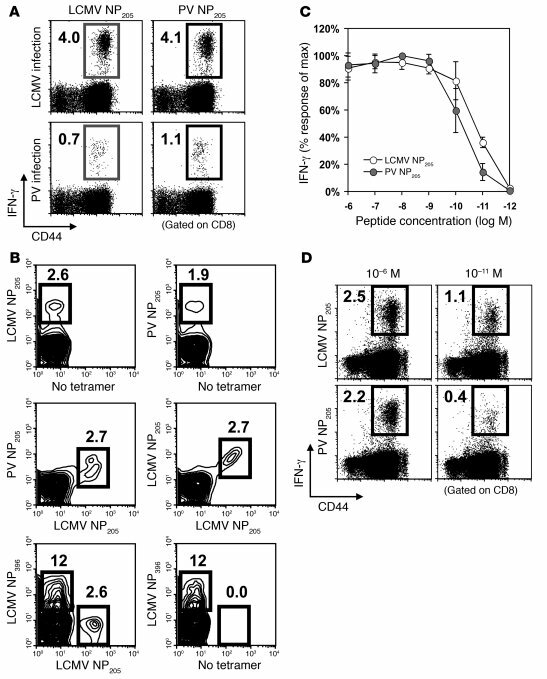 CD8 T cells specific to LCMV NP205 and PV NP205 show widespread cross-reactivity at effector level. (A) Intracellular IFN-γ assay. Splenocytes from day 8 LCMV- or PV-infected B6 mice were stimulated with the indicated peptides. Shown are gated CD8 cells stained for CD44 (x axis) and IFN-γ (y axis). Numbers in the upper-left corners represent the percentage of CD8-producing IFN-γ. The background IFN-γ response was less than 0.1%. This is representative of 3 experiments with 2–5 mice/group. (B) Double-tetramer staining. Splenocytes were stained with anti-CD8 and the indicated tetramers. Numbers represent the percentage of gated CD8 T cells binding tetramers. This is representative of 2 experiments with 3 mice/group. (C and D) Peptide titration. Production of IFN-γ by splenocytes (n = 3) in response to different concentrations of LCMV NP205 or PV NP205 peptide. (C) IFN-γ responses plotted as a percentage of the maximal response (% of max). IFN-γ responses without peptide stimulation were subtracted from each value. Differences between LCMV NP205 and PV NP205 were statistically significant at a peptide concentration of 10–11 M (P = 0.006). FACS plots of data for a representative mouse of 3 with stimulation of 10–6 and 10–11 M of the indicated peptide are shown in D. Numbers recorded in the upper-left corners represent the percentage of gated CD8 T cells producing IFN-γ.